For the sport equipment company, see Kookaburra Sport. Kookaburras are birds of the genus Dacelo and are native to Australia and New Guinea. An adult kookaburra is generally 28–42cm from the head to the tip of the tail. Laughing Kookaburra (Dacelo novaeguineae) – Native to eastern mainland Australia, introduced to Tasmania, Flinders Island, Kangaroo Island and Western Australia. Some were also introduced to New Zealand between 1866 and 1880; but only those that were freed by Sir George Grey on Kawau Island are still there today. Blue-winged Kookaburra (Dacelo leachii) – Native to northern Australia and southern New Guinea. Spangled Kookaburra (Dacelo tyro) – Found only on the Aru Islands and Trans Fly savanna and grasslands of southern New Guinea. Rufous-bellied Kookaburra (Dacelo gaudichaud) – Widely distributed through forests of lowland New Guinea and has also been seen on Saibai Island in Queensland. 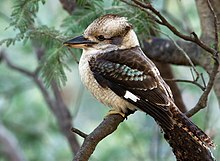 Kookaburras usually eat small animals: small mammals (like mice), insects, small birds, lizards and snakes. Kookaburras usually live in family groups. Young kookaburras help their parents to hunt and care for the smaller children. Kookaburras are well known for their loud call, which sounds a bit like human laughter. Kookaburras use their calling to show others what is their land. Wikispecies has information on: Dacelo. Wikimedia Commons has media related to Dacelo. This page was last changed on 14 January 2019, at 23:26.